My daughter loves Monster High so for her 10th birthday I thought I would make her a Monster High Cake, I just wasn’t sure what I would do. 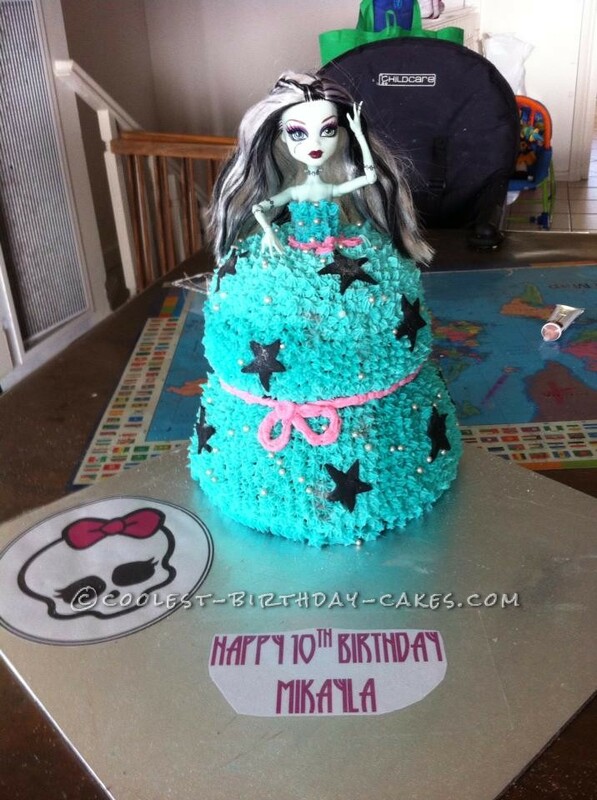 I looked up Monster High things, and thought I’d do the skull logo but at the last minute changed my mind and decided why not try and do like a Dolly Varden type cake with one of her Monster High dolls. I made a red velvet cake because I thought that it suited the whole creepy doll theme. I didn’t have a Dolly Varden tin so I used my glass Pyrex bowl. I had 2 sizes so I cooked two, a bigger one and a littler one. She was having a Frankie Stein doll cake so off I went and wrapped her in glad wrap from the waist down. I put the two cakes together like one big dress and stuck the doll inside and piped blue icing all around which took me 2 hours (it was a big dress) and because she wears blue, black and pink, I then piped a pink ribbon on her dress and then made black stars out of fondant to stick on the dress. I then put edible glitter on the dress as well as little silver cachous all around. For a last minute cake change it actually turned out quite good. 10 10 year old girls were very “WOW! look at the cake how cool”.